If you’re stuck on what to get a special someone for a housewarming gift, or if you’re shopping for decor for your own new home, you’ve come to the right place! This gorgeous, custom made design is stained a beautiful almost-black stain that compliments the grain of the pine wood perfectly. 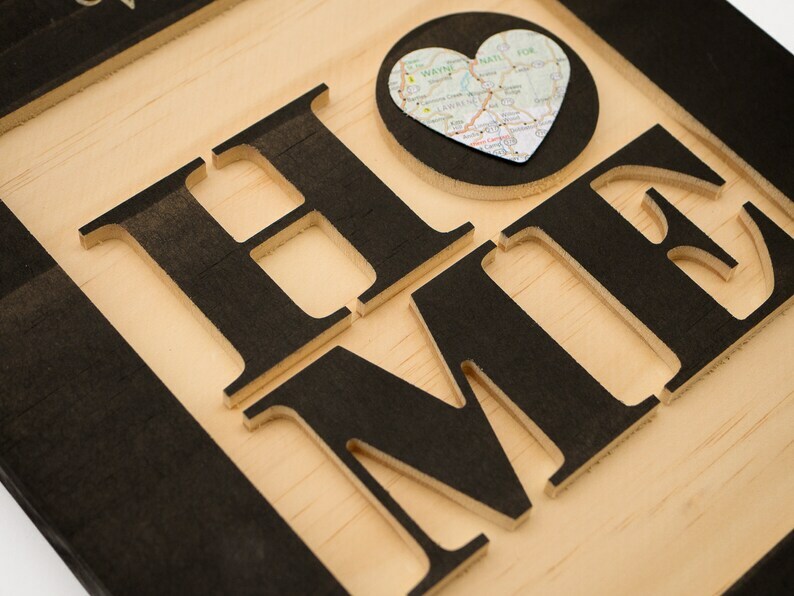 ‘Home Is Where the Heart Is’ and we hope that you will fall in love with this awesome, custom piece. Just the perfect piece for any wall in your new home! 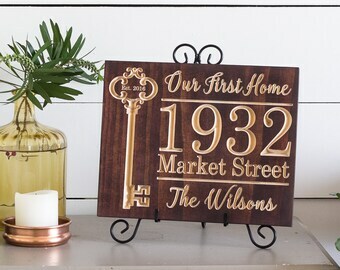 Skillfully cut from a single piece of wood and engraved with your choice of name, address, and date, this unique design also features an actual map of your new place artistically displayed right in the center of the ‘O‘ — really making this item stand out in more ways than one! This great display piece will be custom cut to order — this ensures that no two pieces are alike, so you can rest assured that you’ll be getting a real one-of-a-kind piece. We're very picky about wood quality, so we avoid pieces with knots, holes, or pitch pockets in them. There is a sawtooth hanger on the back. If you are interested in a custom design, we would be happy to work with you to find the perfect design for your one of a kind sign! You can click on the Shipping tab to view my current processing timeframe. I can't take a picture of this item because it I already have a gift wrap. But the item is beautiful I am so please with it. Anybody that wants to get a beautiful gift for somebody I recommend this highly I give this a 10 and five stars I wish they had a a special star for those items that are exceptional. I bought this for my first real estate client as a closing gift. They loved it!!! The quality of the plaque was great and the customer service was amazing. Delivery was swift. Will order from them again. Good overall. The one comment would be that the heart cutout looks a bit cheap. Also, the sticky piece behind the cutout could have been hidden better. Perfect gift for my best friends first home! Great quality and shipped quickly! Very pleased!